Donations to my 3-Day Walk are the easiest way to do it and these donations are tax deductible! Knitters can get any of my PicnicKnits Patterns for 25% off and all proceeds are going to my walk. 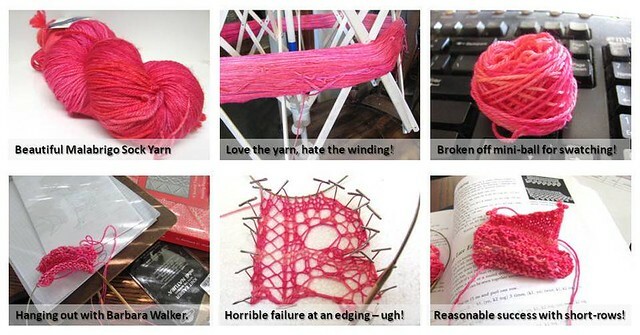 Non-Knitters (muggles?) can buy t-shirts from our Etsy Shop! And anyone can help by helping me publicize my cause! The more folks I can get over here the better chance I have of reaching my goals! In 3-Day news I picked up my air mattress and my duffle bag for the event. I splurged and got myself an Eddie Bauer self-inflating mattress. I figure I'm gonna be super tired and achy at the end of each day and I deserve that little bit of luxury! I tested out the inflation/deflation process this morning and let me tell you, it was so worth the money. And I got a 30" rolling duffel bag to pack everything up in. I need to test out what I'm going to pack soon, and come up with some way to make my duffel stand out! I had mentioned at the beginning of this that I would share some of my designing process. So here goes, a little picture collage of what goes on when I design. This isn't always the way it goes, but it does seem to go this way when I put any kind of deadline on myself. For this design I really wanted to do something ribbon inspired. But honestly I've seen a few things with lace ribbon patterns and I did not like them at all. So at first I thought I would do something with a modified rib pattern. And then I considered a stockinette body with a really intricate lace edging. But then it just wasn't coming together right. So I swatched a simpler border, and then I found a really pretty lace pattern in one of the Barbara Walker books. I've considered it before, but hadn't found the right application. But when you look at it just so, it looks like hearts and ribbons. Not overtly so, but a perfectly subtle sort of thing. And from there it just went. Oh and it's prize time! Today's prize is something cozy for people who don't live in Florida. Just kidding! 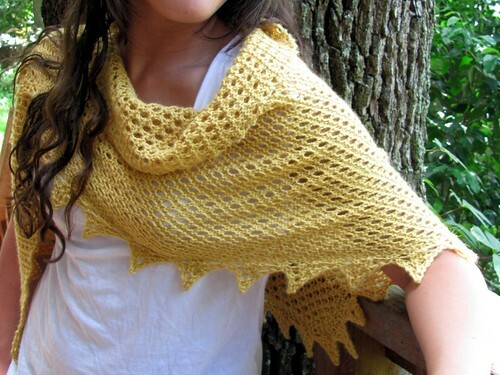 It will make a very warm & cozy shawl, but Florida people have a few days per year when they might wear it. There's even a bit of a chill in the air in the mornings here already! 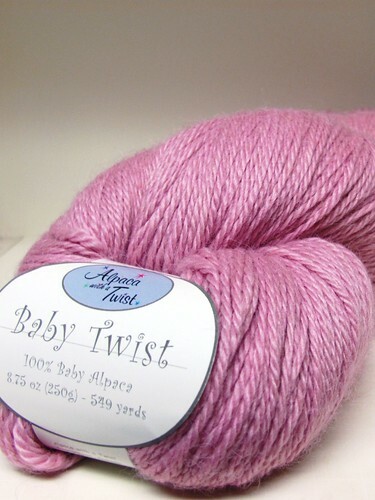 Today's prize is one jumbo skein of Baby Twist by Alpaca With A Twist and a Cordelle pattern to go with it. So for today's comment to enter, I need a name. A name for this new pattern that I'm working on. Oh the pressure of a name. I was thinking something along the lines of hope, faith, courage. But I don't want to use anything that's been used before. So comment away, give me your best original name ideas for this very pink shawlette!